So I don’t exactly have anything ground breaking new recipe to share with you guys today. Instead, it’s a simple and easy recipe that’s been a go-to favourite in my family for years. 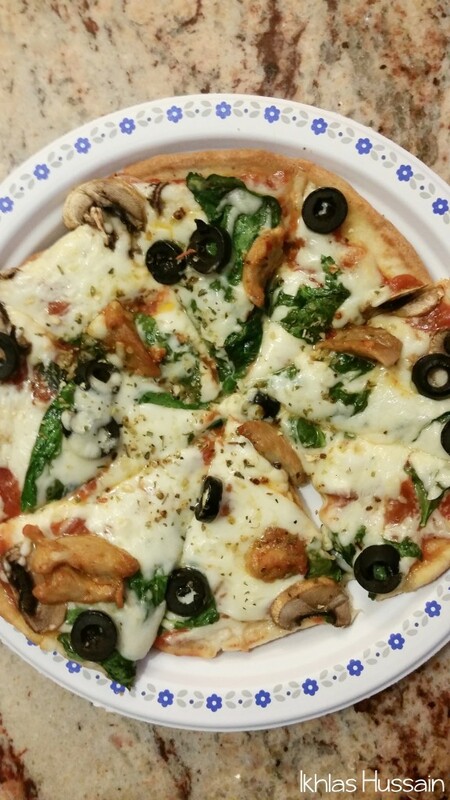 I’ve taken numerous instagram pics of my favourite naan pizzas, and I decided to finally share it with you guys today. 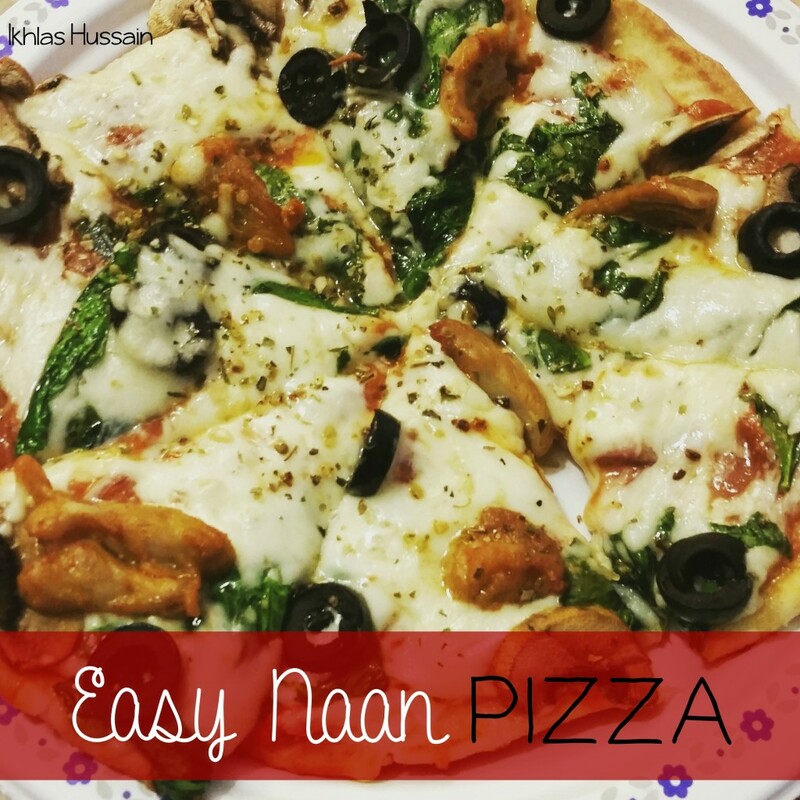 These easy naan pizzas are a family favourite for a reason. They are incredibly easy to make and are basically individual pan pizzas. You can top them however you like. Even if you’ve got hardly anything in your fridge, as long as you’ve got sauce, a naan, and cheese, you’re golden. The rest is up to your imagination! Being South Asian, we always have naan in our fridge or freezer, which means that if we don’t feel like cooking anything, we can always make these mini pizzas. But if you don’t have naan, you can also substitute it with Greek pita bread. It doesn’t have to be fancy naan or pita bread, just the regular grocery store variety will do. The same goes for the pizza sauce. We always have a can in our pantry, which doesn’t go bad, which makes it easy to whip these up. You’re welcome to make your own sauce, but when you’re in the mood for pizza now (who isn’t? ), it helps to have a jar (or two) tucked in the back of the pantry. And the rest is whatever you want! My favourite toppings are fresh spinach, tomatoes, onions, mushrooms, a bit of garlic in the sauce, some jalapeños, and a lot of cheese! I’ve also recently started putting black olives on my pizza and have to say I absolutely love the tangy, salty taste! If you’re feeling adventurous, why not try sundried tomatoes or broccoli? Or some crumbled feta cheese to give it a twist? There’s so many options! 2. Place naans on pizza pan. Spread pizza sauce evenly onto the four naans. Sprinkle with a bit of cheese, and then add toppings. Sprinkle with remaining cheese. 3. Bake for 10 to 15 minutes or until cheese is bubbly and melted. Serve warm. My mom had marinated a bit of tandoori chicken, and so we ended up cooking the small boneless chicken pieces and putting it on some of the naan the pizza too. Instant tandoori pizza! This Ramadan, I’ve been in the mood to eat proper meals all at once, instead of munching on iftari and then having dinner. So these easy naan pizzas work great because it’s filling and everyone gets to have one to themselves. And they can put whatever they want on it, which diffuses the argument of what to put on for toppings when we’re sharing a big pizza. 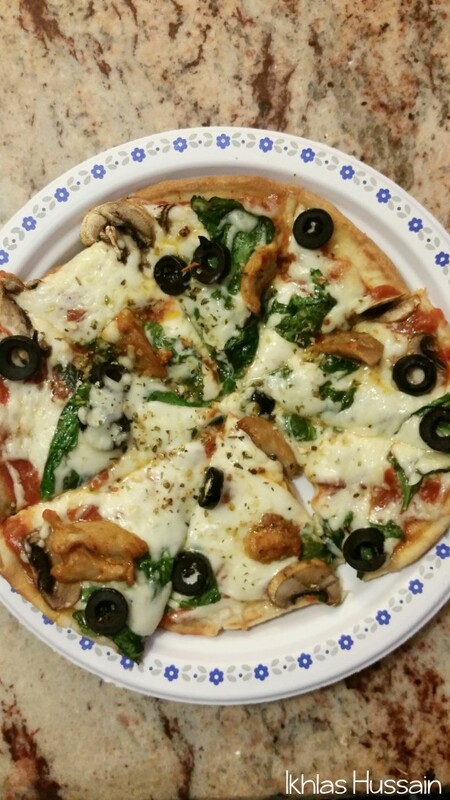 So if you’re always in the mood for pizza, and want an easy recipe, check this out! Done in less than 30 minutes, and with no dough to knead. You’ll love it.